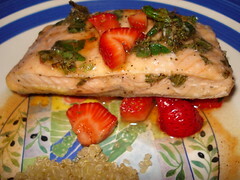 Salmon with Strawberry Salsa | Mmm, Tasty! I realize it’s been quite some time since one of us did a restaurant review here. I hope over the next few days to do a few restaurant related posts. But for now, I want to write about the yummy, summer inspired dish I made tonight. A few weeks ago I discovered the FoodTV.ca Blog and the cooking club that was created with it. Since I like a challenge, I decided to participate in this month’s recipe, Rob Rainford’s Smoked Salmon with Strawberry Salsa. We already had most of the ingredients: salmon we’d recently bought, fresh herbs from the balcony garden I do up every summer, and fresh lemons and limes are a summer staple in this house. I just had to run out to find some strawberries. Those who know me know strawberries are one of my favourite fruits, so this wasn’t an arduous task in the least. I made half the recipe, since it was just Rich and I eating it, and I made my salsa nice and chunky because that’s the way that I like it. The verdict? Very good! I love the combination of strawberries and balsamic vinegar and I’m not surprised that I loved the combination paired with salmon cooked with fresh herbs and citrus juices. We served this with some quinoa and sauteed vegetables and had a great, nutritious dinner.